Body Happy is a personal training studio situated in Hove. For over 4 years, Jenny Day has been running classes and personal training, and has recently expanded to a team of 4 in the past year – Jenny, Andy, Becky and Mark. We all believe in improving the well-being of others and providing lifetime solutions for fitness. The Body Happy ethos is to keep training simple, honest and fun. This blog is to shout-out one of our hard-working members, who has had a positive experience training at Body Happy. Their results demonstrate that fitness does not have to be focused on gaining muscle or losing weight, and we couldn’t be prouder of them. Brenda* started training with Body Happy 7 months ago, as she was struggling with exercise and was due to have a cardiac stent** inserted. Brenda was getting out breath easily, and simple tasks in the gym were very difficult. We approached training Brenda in a personal, positive, simple and honest way. We let her know that we would be starting off slowly, and ease into a training schedule. We began with several minutes cycling, which made Brenda get very out of breath: she would need to rest for 1-2 minutes before we could do the next exercise. To begin with, Brenda would do one set of an exercise, rest for 1 minute and then do another set. We followed this pattern for several weeks. As she started to increase her fitness, the sessions slowly increased in difficulty, and we always made sure to explain to Brenda why she was doing each exercise. Her sessions started as 2 x 30 minutes a week, and we have since increased to 3 x 30-minute sessions a week. Sessions have moved on considerably in the time we have worked with Brenda. She has gone from doing a few minutes on an exercise bike, rest, 3 exercises with long rest periods and finish with a more minutes on the bike, to a few minutes on the bike, some mobility drills, 4 rounds of 4 exercises and finishing with a row or cycle. These sessions have increased in difficulty simply by asking her to perform the same amount of work, 4 rounds of 4 exercises, in less time, reducing rest periods between exercises. Over 7 months, we have monitored the Brenda’s daily steps, encouraging her to increase the number she takes, as well as doing a ‘weigh-in’ every two weeks. Brenda has also made positive changes to her diet, making subtle changes to what she eats, as well as buying a home exercise bike, which has proven to be a really positive household addition! 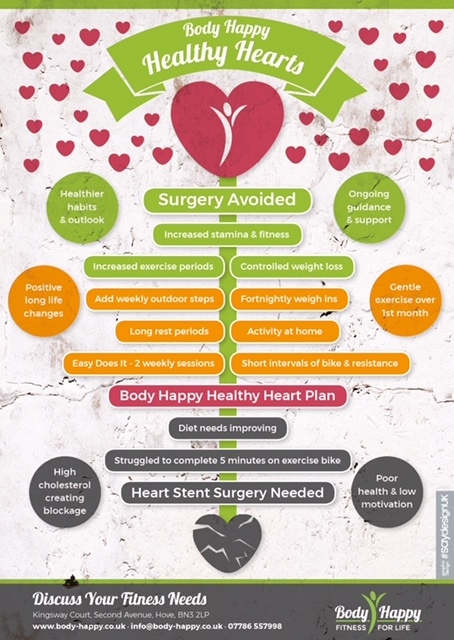 This structured approach to the training plan and the hard work and effort of Brenda has shown some incredible results: when she was sitting on the operating table and the surgeon went to put in the stent – her blocked arteries had cleared up, meaning she no longer needed a stent! This is not the end of the road for Brenda, we are still increasing the intensity of the sessions and making sure she keeps on track with weight loss goals and targets – and never needs a stent. Brenda’s story shows that it is never too late to start exercising, and that training can be about so much more than just weight loss.